I ACKNOWLEDGE APARTHEID IN PALESTINE EXISTS. IF YOU CHANGE THE NAMES, THE DESCRIPTION OF WHAT IS HAPPENING IN THE GAZA STRIP AND THE WEST BANK IS THE DESCRIPTION OF WHAT IS HAPPENING IN SOUTH AFRICA. Apartheid was the racist legal system that once ruled South Africa. It prohibited non-whites from voting, from entering specific regions, from marrying whites and much more. In response, the UN built a framework to criminalise Apartheid, defining it as acts committed by one racial group to dominate and oppress another. For example discriminatory persecution, imprisonment, torture, forcible transfer, expropriation of land and resources, deprivation of freedoms, cruel or inhumane treatment, creating separate reserves or ghettos, arbitrary violence and all legislative measures designed to benefit one group at the expense of another. All these acts are now distant memories for the South Africans who once lived under white minority rule. But they are the today's realities for Palestinians living under Israeli rule. Within Israel, authorities have 50+ laws that privilege Jewish access to land and immigration. They keep secondary education separate and unequal. They exclude residents from neighbourhoods on the basis of ethnicity or religion. They award social benefits on account of military service, thereby excluding most Palestinians. And they've made it illegal for Jewish citizens to marry non-Jewish citizens. In the Occupied West Bank, where Jewish settlers live in colonies on Palestinian land, the discrimination is more stark. Authorities let settlers vote in Israel. But not Palestinians. They subject settlers to civil law with fair trials. But they subject Palestinians to military law and can imprison them without trial. They give settlers freedom of speech and assembly. But they punish Palestinians for nonviolent demonstrations and other ‘free speech activities’. They give settlers exclusive roads that Palestinians are not allowed to use. They choke Palestinian movement with checkpoints and permit requirements, but not settlers. And they make this possible by giving settler cars and Palestinian cars different coloured number plates. They make it almost impossible for Palestinians to visit Jerusalem, but not settlers. And they make it near impossible for Palestinians in the diaspora to settle in the West Bank (even if they marry a West Bank Palestinian), whilst Jews from anywhere in the world can easily settle in Israel or a colony within occupied Palestine. Palestinians who throw stones are liable for up to 20 years in prison, whilst Israelis are not. Palestinians whose loved ones engage in acts of terrorism have their homes demolished, whilst Israelis do not. Israeli authorities also restrict the rights to education, health care, holy sites, employment, unionization and more for Palestinians. This is why black South Africans that visit occupied Palestine say the same thing: Israeli occupation is worse than South African Apartheid ever was. My colleague with a green West Bank ID will travel in a separate car with green Palestinian license plates and into a different queue where it may take hours to clear the checkpoint—if he has a proper permit. 'Segregated Roads' is an infographic which invites you to imagine a road system in which the color of your license plate determines your mobility. Cars with Palestinian license plates are not allowed on Israeli roads, regardless of the identification held by the driver. Even on Palestinian roads, cars with Palestinian plates have restricted access, face endless delays at checkpoints and are subject to regular road blocks. Cars with Israeli plates experience none of these difficulties. Apartheid Israel provides a critical insight into how it’s been possible for Israel to implement an apartheid legislation, yet maintain its reputation in the West as the only democracy in the Middle East. This documentary show the impact which the segregation wall has on Palestinian lives, comparing their daily struggles to the Israeli settlers who prosper with subsidies from the Israeli government. 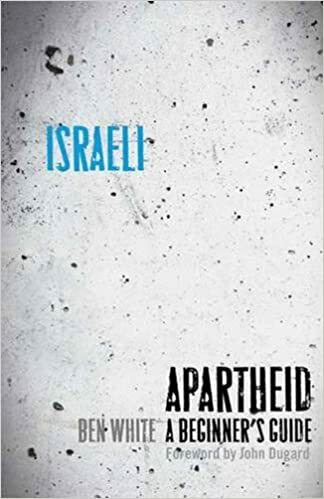 Apartheid in Palestine is a compelling work that brings together many stories of Israeli apartheid and its effects on the ground for the millions of Palestinians that it affects. This is the New York Times Best Seller book written by Jimmy Carter, 39th President of the United States in which he explains how Israel's continued control and colonization of Palestinian land have been the primary obstacles to a comprehensive peace. Israeli Apartheid: A Beginner’s Guide gives readers a clear understanding of the situation of apartheid in Palestine.